Wedding Bar Guide: How Much Booze Do You Need? Get your booze clues here: what to serve, how much to spend and other toast-worthy tips. Weddings are about love, hope -- and toasts! As such, most brides and grooms provide guests with lots of champagne, wine, beer and spirits throughout the night. What do you expect to serve? Here’s how to stock up according to your guests’ tastes -- and your budget. 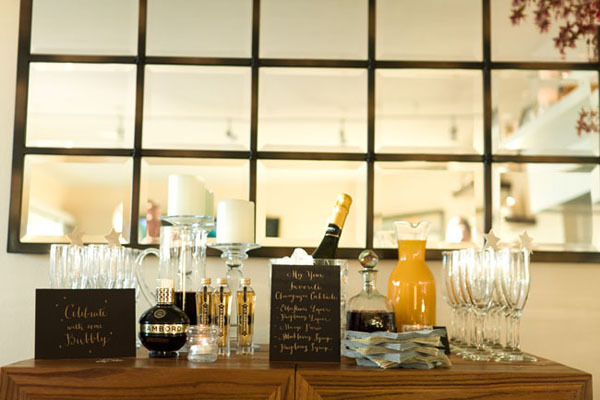 Many couples opt for an open bar, where guests have access to unlimited drinks throughout the entire reception. While this is certainly the most gracious approach, it’s also the most expensive and could end up costing as much as 10 to 20 percent of your total budget. An alternative is the “limited,” or “soft,” bar, where you offer a careful selection of drinks (say, wine, beer and vodka cocktails) at the bar during specific times (throughout the cocktail hour and right after dinner), then have waiters serve wine or beer during the meal. On a tight budget? Don’t even think about having a cash bar. Guests should never be expected to pay for their own drinks. Instead, consider skipping the hard stuff, which is pricey, and serve less-costly wine and beer only. Or, opt to offer your site’s “well” brands of liquor, which are less expensive than premium brands; the same goes for house wines and champagne. Also, discourage the wait staff from refilling wine glasses at dinner without first asking guests if they want more. If you’re hosting your wedding in a hotel or banquet hall, liquor is usually provided; in your contract, expect to be quoted either a per-person fee or a total price for alcohol. The same is true with established independent caterers. If the caterer does not have a liquor license, he or she will coordinate purchasing the alcohol from a vendor and quote you a price per bottle. If there are bottles left over, you’ll be able to keep them (or the caterer might be willing to reimburse you for them), so you’ll only be paying for what was actually consumed. If your facility allows it, consider supplying the alcohol yourselves -- it can be a huge money saver. (Of course, you’ll have to order and arrange for delivery and cart away the unused bottles after the party.) You may be subjected to a corkage fee, a flat fee charged by the caterer per bottle opened; it’s usually around $10 or more but can be negotiated. Even so, you’ll most likely see terrific savings -- especially if you purchase the alcohol from a wholesaler. Related: Wedding Responsibilities: Who Pays for What? Your caterer can advise you on just how much alcohol you’ll need. But unless your crowd consists of really heavy, or really light, drinkers, a good rule is two to three drinks per person for the cocktail hour and one drink each per hour after that. Have on hand 2 cases of beer, 3 to 4 cases (36 to 48 bottles) of white wine and 2 to 3 cases (24 to 36 bottles) of red wine. Three cases (36 bottles) of champagne should be enough. Also, be sure to arrange to have plenty of soft drinks and water (bottled and tap) on hand.